With a brilliant Peter Pan party! The exciting story of Peter Pan, the mischievous boy who never grows up has been a children's favourite for generations. Peter lives in Neverland and spends his life in never-ending adventures. With its cast of interesting characters and constant action and adventure, Peter Pan also makes a great theme for a kid's party. These are pretty straight forward. An invitation to join Peter Pan for a Birthday Party in Neverland. You may like to draw a map of Neverland on your invitation including perhaps a picture of your house and its address. For extra fun your guests could also learn to fly to the party. Why not include a small bag of fairy dust (glitter or sparkly confetti) with the invitation. Guests then have to sprinkle themselves as they leave for the party. If they are traveling by car then they should perhaps sprinkle that too! Then straight on 'til morning! There are lots of ways you can make your party venue look like Neverland. 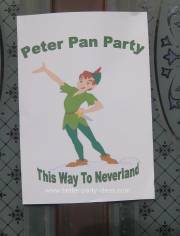 Put the posters up around your venue for a great Neverland feel. Peter Pan party games are not difficult and its petty easy to give many traditional kids party games a Peter Pan twist. This is a Neverland take on the common game Musical Statues. The children dance around to music. Of course you will be there demonstrating some great Peter Pan dance moves! When the music stops you shout Captain Hook! Everyone must remain still as a statue. Captain Hook (an adult helper / Dad) strides onto the dance floor. Have them wearing a pirate hat, painted or false moustache and false hook. Captain Hook then strides around checking for Peter Pan. No one must move a muscle. When he gives up his hunt the music starts again and the whole thing is repeated. 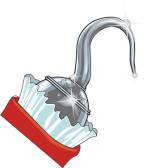 Get your Captain Hook to really act it up - glaring at the children and trying to get them to giggle or move. Tip: Some people play this game with any kids who move having to sit out. We think its better played for fun and everyone stays in all the time. Peter Pan Party Games - Crocodile's Coming! The pirate crew and particularly Captain Hook live in constant fear of The Crocodile. In this game their ship has been sunk and they have to make their way to the lifeboats. But are they big enough?! 2 Old bits of carpet / mats / cardboard - These should be cut to a size where they are a bit too small for half the children to stand on. 4 Pictures of stepping stones A4 (30 x 20cms approx) - These should be on card or laminated. Divide your kids into 2 crews. The carpets are the lifeboats and are placed at one end of the room. The teams are at the other. One by one the children have to make their way to the lifeboat but they must only use the stepping stones (2 per team) to stand on. They must stand on one stone whilst moving the other forward then hopping on to it. If they tread in the "water " The Crocodile will get them. In this way they make their way across to the life boat and jump onboard. The stepping stones are returned (by an adult helper) to the next in line who immediately start to make their own way across. The lifeboat rapidly fills up and you should end up with the kids all clinging onto each other to stay onboard. This can be very funny and results in a lot of laughter. The first team with all their crew aboard is the winner. Tips - Attaching a small loop of string or plastic cable tie to the stepping stone cards makes them easier to move. If the kids are younger you may like to have an adult helper for each team moving the stones for them. This is really a version of musical chairs. Some Invisible Magic Fairy Dust!!! Your cushions or mats are little Neverlands. Arrange them in an oval or two lines in the middle of your room. Gather all the children and ask them if they know how to fly like Peter?. Of course they won't be able to do this properly until they say that they "Believe in Fairies" whereupon you sprinkle them with the Invisible Magic Fairy Dust! It is little touches like this that will make your party special. As music plays your children, who can now all magically fly (its good stuff that dust! ), flit around the Neverlands. Make sure they are all flying in the same direction - You don't want any Peter Pan Pile Ups! When the music stops they have to drop down onto the nearest Neverland. When the music starts they can start flying again. After a few goes for practice remove a Neverland each time. The child who can't find a Neverland becomes a Lost Boy and has to sit at the side until a winner is found. A light fluffy feather for each child. ( You can buy great packs of coloured feather from craft supply and toy shops). 2 Pictures of Peter Pan's head wearing his hat without a feather. Divide you children into 2 teams and hand out the feathers. One by one they must blow their feathers to the wall at the opposite end of the room. When they reach the end they pick up their feather and stick it to Peter's hat using the sticky tape. They then run back to their team and the next person goes. The hat will end up with feathers stuck all over it. The first team to puff all their feathers to the other end and stick them on Peter's hat wins. Variation: If you were "crafty" you could make 2 Peter Pan hats from folded green construction paper. One child in each team could then be nominated as Peter and sit at the end of the course wearing one waiting for feathers to be added. Tip -This game works best with plenty of adult help both in keeping feathers on track and with sticking them on the hat. Captain Hook (an adult helper in a pirate hat) is training his crew. Fire the cannon - everyone loads a cannonball, lights a fuse, puts their hands over their ears and shouts "BANG"
Walk the plank - everyone counts as they take steps forward "1 - 2 - 3 - 4 SPLASH!" You can easily add to this list. Have Captain Hook train his crew calling out the instructions in any order as many times as is still funny. What makes the kids laugh most is when the instructions start coming faster and faster and they struggle to keep up - Much to the Captain's fury! Tip: Having an adult helper planted in the crew is a good way of reminding the kids of the action for each command. Line your kids up in a circle all facing the back of the Lost Boy in front. This is a simple game of following the leader. Call out the name of the leader to copy. As the children dance and skip around the circle the leader performs actions that everyone should copy. Change the leader every so often. When you have done this a few times introduce a Limbo pole held by 2 adult helpers. Adjust its height depending on the child dancing under it. Don't worry too much about correct Limbo technique. Gradually drop the pole lower and lower until you end up with a heap of Lost Boys on the floor! Did you have a great Peter Pan Party?